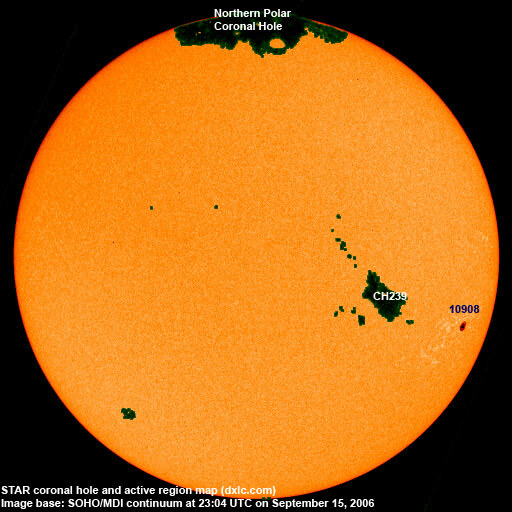 Last major update issued on September 16, 2006 at 03:05 UTC. 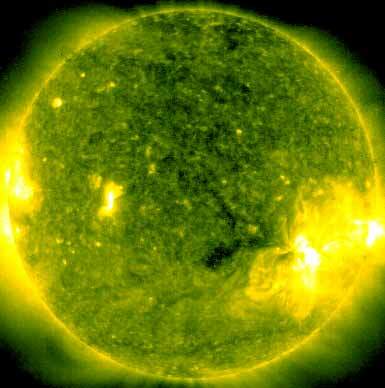 The geomagnetic field was inactive to quiet on September 15. Solar wind speed ranged between 292 and 359 km/s (all day average 319 km/s - decreasing 43 km/s from the previous day). Solar flux measured at 20h UTC on 2.8 GHz was 80.1. The planetary A index was 3 (STAR Ap - based on the mean of three hour interval ap indices: 3.1). Three hour interval K indices: 10001022 (planetary), 10111000 (Boulder). September 13-15: No obvious partly or fully Earth directed CMEs were detected in incomplete LASCO imagery. 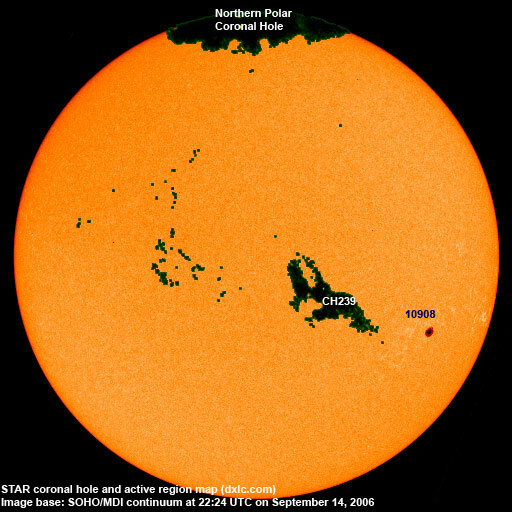 A recurrent trans equatorial coronal hole (CH239) was in an Earth facing position on September 13-14. The geomagnetic field is expected to be quiet early on September 16, the range between quiet and active until September 18 due to a high speed stream from CH239. Long distance low and medium frequency (below 2 MHz) propagation along east-west paths over high and upper middle latitudes is good. Many stations from the eastern parts of North America had fair to good and even excellent signals. Propagation on long distance northeast-southwest paths is very poor.